Явно на первых демках трэки получше. В духе Megadeth, например. Попросил у группы остальное имеющиеся. Formed in 1991 in United States of America (Scarborough , Maine). They have released one EP in 1995 called "Gates of Eternity". Dionysus was born in the basement of the Furst family home. Steve on drums, dan on guitar. Many a migraine headache was inflicted upon our bewildered parents! We also tortured our neighbors by periodically giving "shows" in the grand concert stage of our garage. We moved to california in the spring of 1987 and after Steve graduated college in 1991..we started to get serious about our basement project and find some players who could add their talents to the growing body of songs that had been written. Up until then we had just been playing house parties and school shows with a roatating line up of friends and local musicians. When we finally settled upon a stable line up with Steve on drums, brandon on Bass, myself on guitar and Phil on vocals...I decided to move to england for 8 months. I forgot to mention it to the others...ooops. Things fell apart in my absence but on the upside, I purchased a cheap acoustic guitar in London and in the privacy of my dormroom and the inspiration of Europe around me...began to write the songs that ended up on the Dionysus cd. After returning home in the Spring of '92, Steve and I recuited Dave Hollyburton on bass and Jason Crowley on vocals. Both needed much work to get to the level that Steve and I were at but eventually we got there and started to play private parties and clubs. After lots of gigs, a series of demo tapes and positive local reviews, Dave was replaced by Shawn Mulkins, a graduate of such local thrash bands as Circle of Fear and Last Rites. Shortly afterwards, Jason was replaced by Kurt Wolf. Kurt was finally the vocalist who could deliver not only the voice...but the stage presence and show as well. With this line up, the band went into Suspect Studios in the summer of '95 and recorded for many months. Mixing was done in the idyllic hillside of Canyon Studios.... where disaster was nearly averted by a hungry DAT player. Finally, Gates of Eternity was mixed by Tom Carr at Music Annex and released to positive reviews. 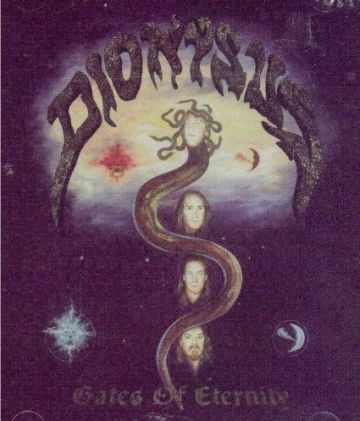 Dionysus played a cd release party at On Broadway in San Francisco and went on to support Gates of Eternity by opening shows for the likes of Machine Head and Vicious Rumors as well as many headlining shows. By early 1998, with the rock scene nearly extinct in Frisco and grunge all the rage..Dionysus called it a day. This website is for the music and for our brother Shawn who was killed in a car accident in 2002. Спросил через Ютуб у того Криса про полный миник.